During 2011 I am going to interview one person a week and post the interviews here. All of the interviewees will be people who live or work along 30th Avenue in Astoria, Queens, New York City. Visit “About” to find out why. And check back here for the interviews in 2011. (One for tasters is here). 21st Street on the west side of Astoria carries a lot of cars, some building-sites, a drive-through MacDonald’s and at first sight, not a great deal else. But on its corner with 30th Avenue there is a restaurant that has become a hub of activity, pulling in a young crowd from the surrounding neighborhood. 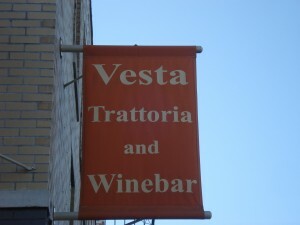 Childhood friends Giuseppe Falco and Leo Sacco opened Vesta in 2008. When they decided to start a restaurant, Astoria was the logical place. They went to high school together here, and Giuseppe had moved back in 2000. But why that particular location? That feeling was right – that young generation of newcomers to the neighborhood has made Vesta their home. “That was the whole idea of Vesta. It was supposed to be a place where you can come in have a glass of wine, have a soup, or just not have anything. They’ve found a place where they can feel comfortable.